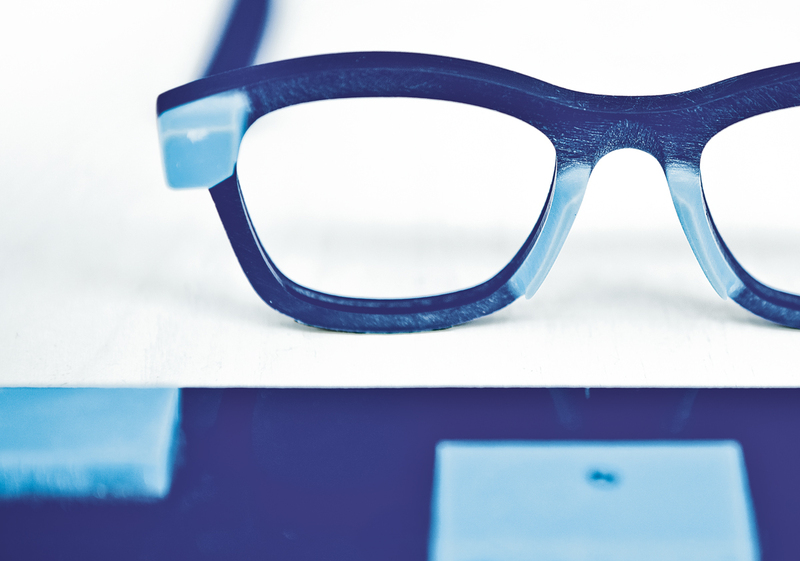 The eyewear industry thrives on innovation. When it comes to design, the creatives in the business continue to prove that variations for spectacles are far from played out. The distribution side of things is a different story, however, and far more pedestrian: the brands keep making glasses and offering them to opticians, who in turn order what they need to keep their customers happy. At least that’s what you would expect. But talking to Jens Heinzerling at his Kurz und Weit (German for “near” and “far”… sightedness) in Cologne reveals a much broader concept of eyewear retail: As a full-service optical provider, he offers customers a chance to design their own, customized glasses in cooperation with his team. EYEWEAR got the story straight from the horse’s mouth. Who is behind Kurz und Weit? That would be me, Jens Heinzerling, 36 years and Cologne resident by choice, founder and business owner as well as my partner, Ina Guse, 33 years, also in Cologne by preference, certified optician and creative thinker who is the harshest critic of Kurz und Weit. Our third partner in crime is André Jansen, 49¾ years, in Cologne by choice, emplozed optician at Kurz und Weit, amateur photographer and designer with a multiple talent! Who fathered the idea for Kurz & Weit? Ina and myself came up with the idea five years ago. After three years of preparation, we kicked it off in 2010! How did you arrive at the concept of offering your customers customized glasses as a service? At one point in my old job, I found myself standing in the store and questioning the meaning behind all of it. I suddenly noticed that I had somehow run myself into a corner, and was having less and less fun at it. And the main reason for my choice of profession had always been the creative aspects and the craftsmanship. So I had to combine what I had learned with ways of having more fun. Your Kurz und Weit store has now been around for almost two years. How does it feel to go at it on your own? All customer feedback is directed 100% to us. And it’s really motivating to see that what we are doing is striking a note with customers, who get what we are going for. Seeing our concept grow and progress is an exciting experience. What are some of the brands and criteria for choosing them? Martin & Martin, Funk, Meyer Eyewear and Framers. There is a story behind every single brand in our store. On one hand, there have already been previous interactions with the people behind the brands and on the other hand, all collections complement each other splendidly. Martin Lehman of Martin & Martin has been a great help in setting up our eyewear workshop. So it was a question of honor to include Martin & Martin into our line-up. Do you see yourself as an eyewear designer or eyewear service provider? In your younger days you announced that you wanted to “create your own glasses” after finishing your education. Was freelance eyewear design ever a career option? I never entertained that thought and the chance never came about. But now I am free to make all my own decisions. The things that I plan and create are offered solely to my customers. Is your workflow digital or analog? At first we draw freely by hand and later convert into digital. This leaves some room for fine details. We are even able to scan colors and include them into the draft. So you can almost see the finished glasses, before you even get started. What’s the process like for customers? There’s a different approach for every customer. Someone will have a concrete idea, which we then implement. Another person may want a reconstructed relic from the 1950s he just loves, made in red, brown or black. And yet another customer may want to create his “own thing” entirely. And what are the individual steps in the process? First of all we really like to understand the customer’s wishes, so we have good rapport. Then we take a photograph of the customer’s face to be able to hand-draw a draft of the glasses right on the image. This also creates an objective view for the customer. If the customer likes the draft, we create a cut-out – a shape sample from acetate – which helps the customer to better envision the frame. It also helps us to fine-tune the size, nose coverage and temple length. The basic DIY-concept is reminiscent of certain ID-offerings, such as customized sneakers by large sports manufacturers. Does your approach share similarities? Not in the slightest. The choices in these ID-offerings, aside from colorways, are absolutely limited. Maybe you can have your own name stitched on there, but that’s it! We offer free choices for almost everything. We may even be able to get your favorite shirt laminated to create eyewear that matches your outfit. What’s the most far-out model you have created to date? A 1950s vintage model in baby blue with marquetry from a 40-year-old decorative acetate. That was exciting! And far-out! How long does the production of a customized pair of glasses usually take? Depending on how complex the requirements are, the glasses can be finished within three weeks. The more difficult ones may take a little longer. What kind of costs are customers looking at for their finished product? Our basics start at €299. Additional manufacturing steps factor at €50 each. The price is like a construction kit, easy for customers to track. Prices for wooden or buffalo horn glasses are calculated individually based on material requirements. Which parameters are customers free to decide themselves? All of them! There are no limits, even the plastic colorways can be manufactured individually. What kind of materials are you working with? Acetate is the classic. We offer about 800 colorways for it. But we also work with wood, buffalo horn and stainless steel, aluminum and the classic metals from eyewear manufacturing. Some of the more elaborate plastics we offer are elforyn and juma. This is a minerals-based material very similar to ivory, developed and manufactured in Germany. Do you have a personal preference for any materials? 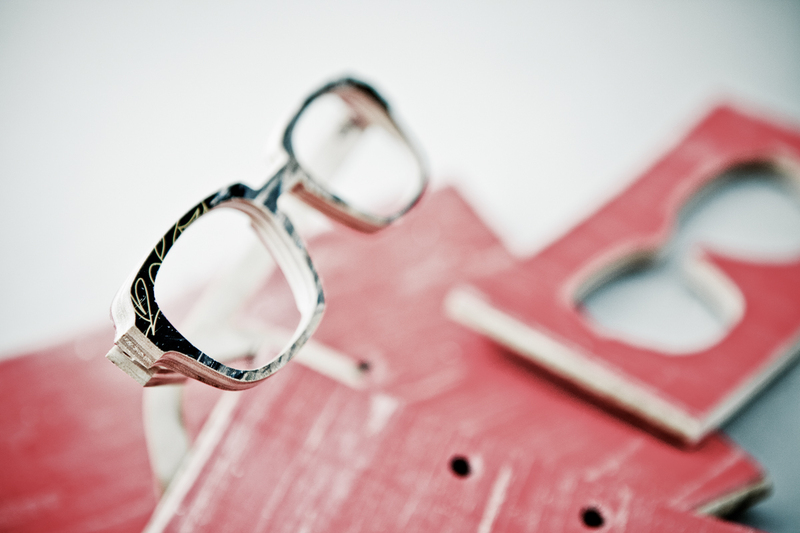 Could your DIY-glasses be interpreted as competition to the labels you are offering? No. Whenever customers have the intention to go with a customized eyewear frame, they will know it right away. What separates Kurz und Weit from other optical stores? Who are your customers? Do you get customers from outside Cologne in the store? From students to university professors to sophisticated retired couples, we get everyone. I’m always amazed by how people find out about us. Most of the time, people from further away come to us. We also have some customers abroad. The furthest we shipped a pair of glasses was to Cape Town. How do people learn about you? Most of them find us through word of mouth. Some find us on the Internet or have read an article about us. And there are some chance encounters, some footfall, if you will. One customer we met on the flight back from our vacation. She had wanted her own customized pair of glasses for a long time. So we built it for her. Do you know of any eyewear manufacturers that offer the same service as you?! Over the years, we met some people who are supplementing their business with self-made eyewear. But I have not met anyone doing it at our scale. What do you appreciate the most about the way you work? Being able to do what I really want and dazzling my customers with it. You work relatively independently of trends and the market. Do you still attend tradeshows? Yes, of course! I’m mostly interested in the construction of various eyewear frames and their quality, as well as the production methods. Which trends are you noticing for 2012? What’s headed our way? There’s a trend towards delicate and fine shapes. Plastics will remain dominant. And large-sized shapes are far from finished. Really bright colors are entering the picture. Metal frames will continue to advance and there are more combinations of materials again. I’m looking forward to it!